Neighbors - We're blessed with many good neighbors here in Virginia. We had a couple of wonderful neighbors, Ken and Yvonne, who years back moved to Tennessee. Yvonne had emphysema and was on oxygen, but Ken was an amazing attentive husband and was her caretaker which meant he didn't get out and about hardly at all. He's one of those guys that loves talking with people and being on the go, so I know it was difficult for him but you would never know it. They were from England and his attitude was that she traveled the world for his career, so now it was his turn. All of that to say Yvonne died in January and recently he sent a couple of pictures of her more adventuresome side. One of them was her holding a baby alligator and having a huge snake around her neck from a place in Florida back in 1982 and the other in Florida again on her knees petting a larger alligator in 1993. 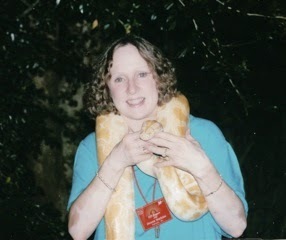 I told Ken I knew why we were kindred spirits and sent him this photo of me with an Albino Ball Python. Travel: Asia and Georgia - In 2002, we had earned an award trip to Singapore which also included a cruise to Langkawi, Malaysia & Phuket, Thailand. Singapore had a place called Night Safari which was very cool since the animals were all in natural habitats and even had to hunt for their own food (which was aided by the release of "food" by caretakers). They had a grand buffet dinner which was on our itinerary and various people were walking around carrying animals. You can imagine I was definitely the last person in the whole group to finish my meal. I saw this guy on the other side of the pavilion and went over to see the snake. He allowed me to hold it and instantly I put it around my neck because it was VERY VERY heavy. They can grow up to 20 feet and weigh up to 200 lbs. We had an exciting tram tour after dinner where I saw animals I'd never seen before, not only up close and personal, but even on television. It was an awesome place to visit. Check out Night Safari in Singapore and/or View Photo Album of Entire Trip. There were some really cool birds and wildlife. We had been to Malaysia before on a 10-day speaking tour in 1994 which included four cities. That's when I realized how much I loved Asian food. The flowers, birds and people were all incredible. Such joy in their hearts and pride in their country. In each town we had a different host and got to see so many things. One of those "pinch me, is this real" kind of events in your life. We flew First Class and had hotels that were breathtaking. We would tour where ever the hosts took us, and they all seemed to outdo each other, and then at night we would do the meetings and stay up past midnight to answer questions. After speaking they gave us three days to just enjoy ourselves. View Photo Gallery of Malaysia. 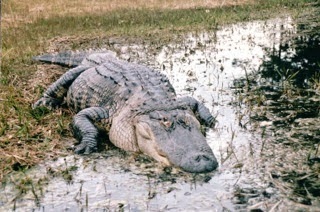 The alligator that Yvonne had in both photos reminded me of our visit in 1997 to Okefenokee National Wildlife Refuge in Folkston, Gerogia. We took a boat ride into the swamp which was very interesting. It was my first swamp tour. There was a huge alligator who was a long-time resident and so the boat pulled right up next to him. I got a great photo I think and was very excited about that. This was all before the days of a digital camera for me. View Photo Album of Okefenokee. Getting Outdoors: National Park Free Admission - One of our country’s greatest treasures is our National Park system, 405 extraordinary and beautiful places to explore and enjoy. Did you know that there are several free admission days for National Parks every year? This means that on certain days every year, the entrance fees are waived, making the National Park experience even more affordable than it already is! Take the opportunity to schedule time at a National Park this year! Birds: Creating Temporary Habitats - Since bird populations are indicators of ecosystem health, it's important to track their numbers to determine where conservation efforts are needed most. Climate changes is threatening some of North America's most beloved birds. Shifting temperatures could greatly reduce the habitats for 10 of the U.S. state birds. Bird watchers are helping by entering as many as 8 million bird sightings every month at eBird.com, an online database with nearly 250 million records (you can help too). The Nature Conservancy (TNC) has come up with a unique was of providing habitat in California. 1 billion birds (350 bird species) migrate along the Pacific flyway each year, many of which need to forage in wetlands, once abundant in California, but now cultivated by farmers. TNC has a program that pays rice farmers in the northern Central Valley to flood their fields during peak migration times. These "pop up" habitats are cheaper than setting aside and maintaining permanent refuges. (Info Source: National Geographic) Read more about this good news story. Birds: Winter Memories -We had a flock of Mourning Doves during our really cold spell of winter and these two were keeping their noses warm by tucking them in. Not a safe way to look out for hawks though. 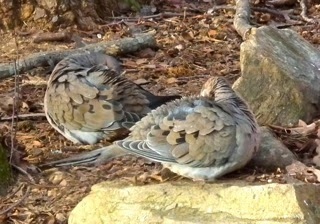 We do have four species of hawks and it always makes me nervous when Mourning Doves look so exposed. At least the hunters here are only hungry hawks and not people shooting for "sport." Mourning Doves are the most frequently hunted species in North America. Every year hunters harvest more than 20 million. We have had a pair or two as residents and enjoy the cooing sung by the male. I used to think it sound very sad, but now that I know it signals the beginning of this bird's habits of nesting, claiming territory, and raising young, it's a happy song. It's fun to see the male chase after the female as she waddles away in front of him. They are such timid birds, but they sure have a beauty about them. They feed busily on the ground, swallowing seeds and storing them in an enlarged area of the esophagus called the crop. Once they’ve filled it they can fly to a safe perch to digest the meal. The record seed count is 17,200 bluegrass seeds in a single crop. Quite amazing! We feed them millet and they enjoy the droppings of sunflower seeds from the feeders. I've also seen them eating cracked corn. Health: Essential Oils - Last week Nature's Sunshine unveiled an increased line of aromatherapy products—28 singles, 8 blends, 2 kits (not available yet) and more! Also including many that are now in larger 15ml bottles and better pricing than the original 5ml. They are also on sale at 15% off through April 20, 2015. Take a look at the "on sale" products! Tidbits: Glowing Tampons - In the United Kingdom, a University of Sheffield research team has sought to answer one of the eternal questions facing humanity — how female hygiene products can be used to detect sewer misconnection discharge. Yep! This is for real. They want to use glowing tampons. "Tampons are untreated," said Professor Lerner. "They have not been exposed to the processes which affect most other cotton products, they come in clean packets and they've even got a string. They are the ideal objects for this." Discovery of Most Undisturbed Rain Forest - In a scene straight from Raiders of the Lost Ark, archaeologists believe they have found the fabled lost White City of the Monkey God in Honduras. Aided by former Special Air Service (SAS) soldiers, the team of scientists uncovered the location in the Mosquitia jungle, along Honduras's eastern coast, over 500 years after the last time it was visited, according to National Geographic. The rain forest surrounding the area is so primeval that the animals appear never to have seen humans before. 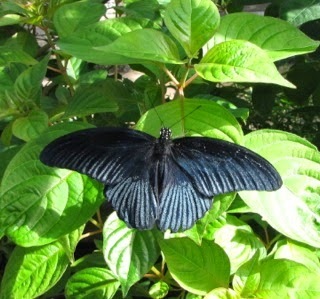 Mark Plotkin, ethnobotanist, said: "This is clearly the most undisturbed rain forest in Central America. The importance of this place can’t be overestimated." Read more about it. Celebrations - Our 38th anniversary was on the 9th and in an impromptu moment we decided to do an overnight in Norfolk, Virginia. It's 3 hours away so we left on the Saturday before Easter. We had a free night's accommodation at a Residence Inn Suite that was going to expire and it seemed quite appropriate to use it. I wanted to celebrate Resurrection Sunday on a deserted beach with the Lord (and my sweet husband). I found one within a state park and although not totally deserted, there were only dog walkers and a family flying a kite too far away to hardly see. It was a beautiful day to be with Jesus. We got to rejoice in our cat's passing on to her heavenly body in joy and playfulness again. She was such a sweet kitty. We were blessed to have her so long. She was an FIV kitty (like HIV in humans) and in the last 3 years had kidney issues, but she lived to be 19 years and 8 months old. That's 95 in human years when you using a Cat Calculator since it's not just a certain number of years for each year. 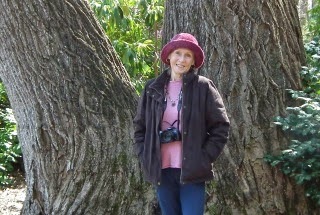 We visited the Norfolk Botanical Gardens on Saturday when we got into town. What a huge place that is! Fortunately there are benches or stone walls everywhere to sit and rest. It was a chilly day for the morning but warmed up nicely. We took a picnic to eat somewhere along the paths on one of those garden benches. Plenty of things in bloom and of course it hit my photographer's passion on the spot. View Norfolk Botanical Gardens photos. I especially loved this one tree we came upon. Huge as you can see from the photo. How much that tree could tell us about the storms of life, how to deal with them, and how to move on. Trees are such a grand expression of God's mighty power. Norfolk Botanical Garden is home to many notable trees. 61 trees are now listed as state champions in the Virginia Big Tree Program and 5 trees are listed in the Remarkable Trees of Virginia Project. I love it when places and towns place importance on trees. God gave them to us for so many reasons and without them our lives are precarious, as evidenced by countries who have removed much of their forests and now have so much destruction from winds, floods, hurricanes, etc. Kitchen Gardening - Somewhere I was searching online for information and found something else. Isn't that a common thing? It's been an exciting thing though since I love green onions and since we don't go to town every week, I don't always have them handy and ready to use. I saw an article that said you could grow green onions in water. For some they're even growing without sunlight, so you can just sit them on the counter. You put a bunch in to fit tightly in the open jar, then you cut them off as you want to use them leaving a good nub on the bottom above the roots (1-2" is best) so they can grow right back again. Make sure the water doesn't cover the whole onion or they will rot. This is a great way to get continuous onions without buying them and without even having a patch or pot of soil to grow them in. 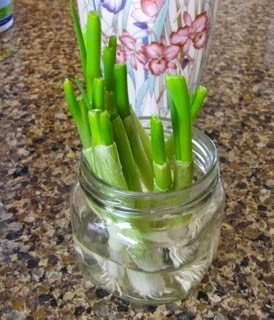 I got 3 bunches of green onions and put them in various jars and on the first one cut off all of them and then let them sit changing water every other day. As you can see from the photo, they've grown amazingly fast! Read the article. Nostalgia - I was born in 1950 so I could really relate to this 4 minute slide show of that era that my friend, Rainbow, sent me. Since it's the age of Baby Boomers, there's a lot of you that can relate also. Enjoy seeing things you've forgotten about: Lost in the 50's - Another Time, Another Place. Spiritual - Psalm 91 is a chapter of the Bible that I memorized many years ago and it has served me well in many situations. I recently read Dr. Jim Richards discussion of it and got even more insight into this beautiful passage of Scripture that tells us how we get this Psalm 91 protection. In the Hebrew language, these verses are so powerful. Following are definitions for some of the key words in this passage. With those definitions in mind, lets look at this scripture again to add depth to it. Today, in your Secret Place, sit still with God! As you sit in stillness and quietness, realize that you are permanently protected. With Him you are safe and with Him you can always expect good things (hope).